A report by Transparency Market Research (TMR) throws light on the key dynamics operating within the global market for wearable injectors. The competitive landscape of the global market for wearable injectors has witnessed the entry of several newbie players over the past decade. 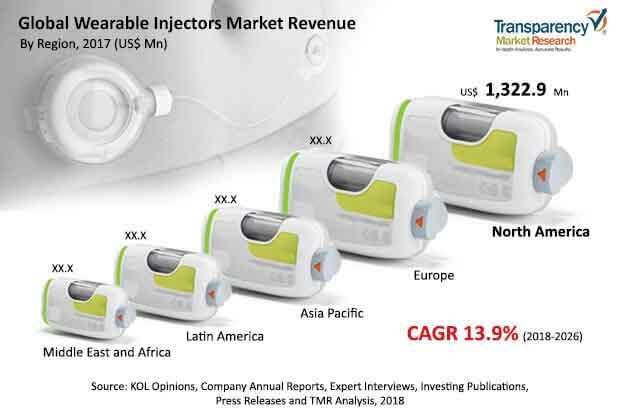 This abrupt influx of new vendors can be attributed to the large market gap and lucrative growth opportunities floating in the global wearable injectors market. In order to counter the entry of new players, the established players in the global wearable injectors market have launched several schemes and strategies to attract the consumers. Mergers and acquisitions are projected to be a gold mine for the established market players who can expand their geographical reach by acquiring smaller players. Furthermore, non-price competition is also anticipated to be a key strategy of the larger market players over the forthcoming years. Hence, it is safe to prognosticate that the market vendors within the global wearable injectors market would tread along a path of economic stability over the forthcoming years. The global market for wearable injectors is projected to expand at a stellar CAGR of 13.95 over the period between 2018 and 2026. The total market value stood at US$ 2,920.2 Mn in 2017 and is expected to reach an astral value of US$ 9,038.1 Mn by 2026. Based on geography, the market for wearable injectors in North America is expected to outdo all other regional segments. On the basis of end-use, diabetics are expected to be the largest consumers of these injectors. The demand within the global market for wearable injectors has been escalating on account of the rising incidence of severe chronic diseases. Several patients are in dire need for continual administration of drugs in order to maintain their health, thus, necessitating the need for wearable injectors. The injection of insulin in diabetics is carried out through the use of wearable injectors, and this creates lucrative growth opportunities within the global market for wearable injectors. Treatment of diseases such as cancer, arthritis, psoriasis, and Crohn;s diseases also involves the use of wearable injectors. The inclination of the masses towards easier methods of drug injection has also le to the growth of the global market for wearable injectors. Furthermore, the rising geriatric population that is at a risk of suffering needle stick injuries also propels demand within the global wearable injectors market. Despite several advantages of wearable injectors, several hospitals and healthcare centers still prefer to use traditional methods for the injection of drugs or hormonal liquids. This has emerged as a huge roadblock for the growth of the global market for wearable injectors. Furthermore, the lack of skilled professionals who can inform and instruct the patients about the usage of wearable injectors also hampers the growth of the global market. However, the nascent developments in the healthcare industry and sophistication of medical procedures are expected to propel demand within the global market for wearable injectors. The review is based on TMR’s report titled “Wearable Injectors Market (Type - On-body Wearable Injectors, Off-body Wearable Injectors; Application - Oncology, Diabetes, Autoimmune Disorders, Cardiovascular Diseases, Infectious Diseases; End use Industry - Hospitals, Clinics, Home Care Settings) - Global Industry Analysis, Size, Share, Growth, Trends, and Forecast 2018 – 2026”.